I've been working around 3 weeks. It's quite tiring because I don't have shift. From 10am until 10.30pm. And it's repeated almost everyday. But it feels really good because finally I can set my mind to rest, and my body do all the work. There are 4 people that work together with me. My uncle, Kak Is, Nuoy and Ahdeq. Ahdeq just work as a part timer here. Its really funny when I have a conversation with Kak Is using 'Kak Is-saya' because Nuoy just used 'aku-ko' with her. It's funny because they will suddenly change into 'akak-adik' conversation infront of me. Haha. Well I feel like its important to put 'kak' for girls that is older than me (although some says they don't like it). I feel more comfortable. I really do wanna call Wawa with Kak Wawa but considering none of the boys use it so.....I just call her Wawa. One thing that I feel really weird is that I suddenly become more sensitive these days. There's a time when a family with their children that suffer retardation come to the counter to order Nasi Ayam from me, I'm stunned and nearly cried. The only people I recognized come to RTC Gopeng is one of UiTM Penang ENT lecturer and Nurakmal's family. Her father, mom and sister. It's funny because Pakcik Azizan wears blue T-shirt with "Azizan'' name on it. Then I immediately check Akmal's FB to confirm it's her father >_< . Akmal lazy to follow them, wew. 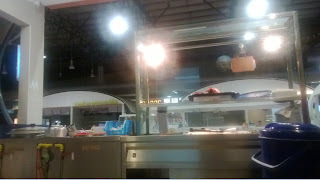 I'd started to work at my uncle's Chicken Rice shop, at RTC Gopeng. This is the 2nd days. Quite tiring, been doing all sort of work. From casher till cooking. But still it's fun to learn all sort of things. But being busy is a good thing, because I can distract my mind from keep thinking of thattttaannnywayy..